Lucky enough to be heading to New York? Or how about a ‘virtual’ trip? Either way, your kids can have the Big Apple scene sorted with a brilliant new travel guide just for preschoolers. I always find that half the fun of a holiday is in the anticipation and planning – I love nothing more than attacking a travel guide with a highlighter pen, marking all the things I want to see and do. Children have just as much fun ‘looking forward’ to a special holiday and some time spent talking about what they might see and counting down the number of sleeps until you go adds to the excitement. Thanks to Look Out World: Here I Come! 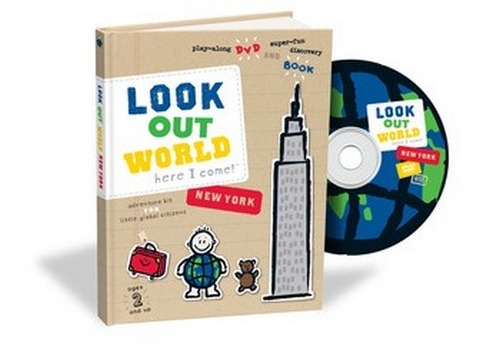 New York Adventure Kit, preschoolers now have a whole new way of preparing for a big trip to the Big Apple. The kit includes an ‘interactive’ travel book and DVD. Tour guides Otto (a little boy), Blink (his teddy bear) and Casey (a suitcase) take you to visit all the major landmarks in New York including Central Park, chaotic Times Square, the Statue of Liberty and the Museum of Natural History. Young travellers get a good glimpse of everyday sights as well from busy streets to yellow cabs and the subway. Both the book and the DVD include lots of New York related activities – build your own mini Empire State Building, make a pizza, learn about colours, shapes and counting and hunt for the missing suitcase. So much to do before you have even left home! Look Out World: Here I Come! New York Adventure Kit is the first in a series of Look Out World Adventure Kits. Coming soon is London, Paris and Shanghai. The New York kit is US$19.95 and can be shipped to Australia.